Indispensable app for sight musicians. Play the pitch of a note as they are written on the sheet music. Perfect for choir members. Set Pitch Staff to match the key signature of the score and check the pitch of notes as written on the grand staff. Pitch Staff plays the pitch tone using one of four sampled instruments: piano, violin, guitar or synthesizer. Up to 4 simultaneous touch point polyphonic sound to test out harmonies or new chord. Supports full range of key signatures right there on the G and F clef. Support calibration of A440 standard and to any other frequency standards. 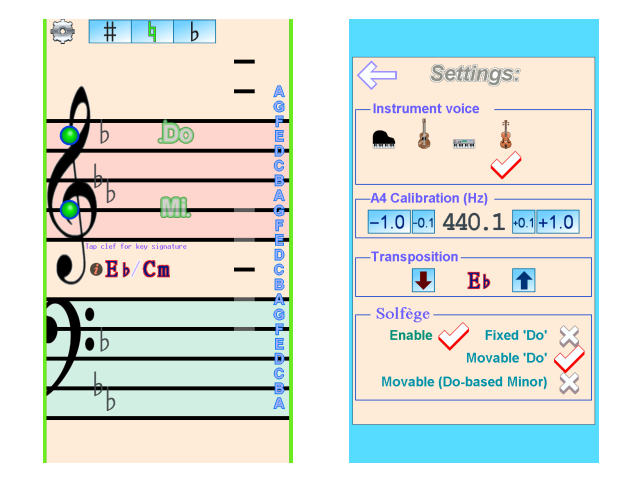 Supports full Solfege (or solfeggio): Movable Do, Fixed Do or Movable Do based minor. Supports headphone and earphone use. This really makes it a powerful tool in choir practice session. Supports external speakers to play the notes for everyone. Perfect tool for teaching music! All sampled instruments are high fidelity 44.1khz. Pitch range of G2 ~ C6.